Okay I’ll admit it – I am constantly lecturing clients about having some patience, while trying to calm them down after only two months because they expect their ranking to take a massive jump. But now the tables have turned somewhat…my patience is running thin; but not because of time constraints constantly imposed on the team, but because our clients just don’t give a Yahoo! That hurts our feelings…and can you imagine how Yahoo must feel? More than likely that number has grown a bit since December 31, 2013. Let’s take a look back so these numbers really sink in; by doing this we get an even bigger picture and outlook for the future. So now you know how many people are online; let’s break down where they perform their searches. Obviously Google is number 1, but let’s really look closely for arguments sake. The following charts and numbers were calculated end of 2013, and yes Google has come out on top, even more so then in 2012. But what most are forgetting is we are talking about billions here…not thousands or even millions, BILLIONS. 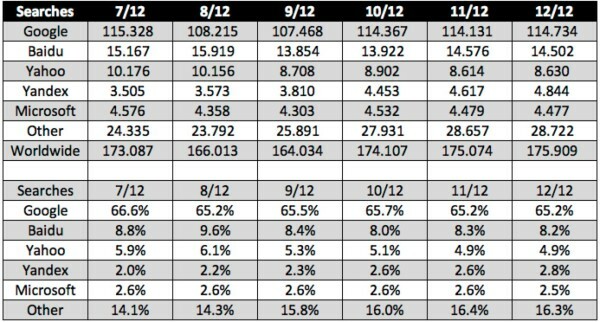 The table above shows the number (in Billions) of searches over a period of several months for each search engine, on a worldwide basis. The “other” figure are searches that happened on search engines that aren’t one of the popular 5 search engines. 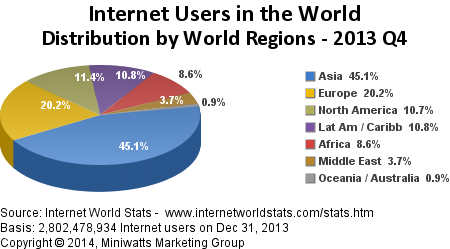 Below that, you can see the percentage share each search engine has for the worldwide total. The point is you still have potential clients or leads within other search engines. Yahoo may seem low with only a 4.9% share, but remember that 8.6 billion searches take place on Yahoo alone. That’s 8.6 billion searches for every type of business there is. If you think your business isn’t being searched, think again. Not just Yahoo either, take a look at Bing – they see a lot of action as well. Albeit the algorithms are different for each search engine; take Google for instance, they put a lot of weight on natural looking backlinks. Google rewards you for a large and natural backlink profile. Bing on the other hand, rewards sites with W3C compliant code, and web pages with tight focus on a particular topic. All three however; love quality content and a content strategy is needed to win on every search engine. Yes it’s true – Google is tougher and stricter when it comes to ranking with them, but with good reason. For a search engine that dominates the searchers on a daily basis, they have to ensure a clean and precise search result. The same can be said for the other search engines as well. The bottom line is you can no longer ignore the other search engines – your customers are waiting, and you are missing out on ROI with an online marketing campaign. When we review your sites optimisation or even optimise your site for you, one of the first things we do after improvements have been made is resubmit you to the search engines; this includes Yahoo, and Bing as well as Google.